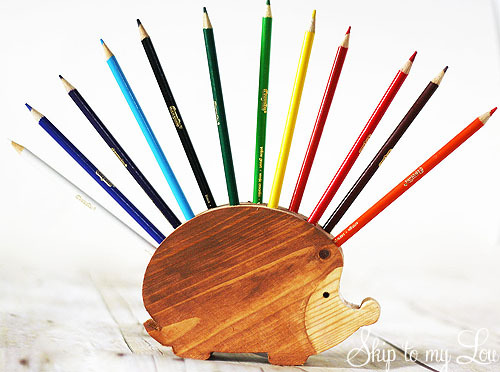 This wooden hedgehog pencil holder is a great handmade gift that you can make yourself. This month Lowe’s challenged me to make a handmade gift. I think all my little nieces are going to love these holders for their colored pencils. If you are looking for more handmade gifts be sure to check out my handmade gift guide. 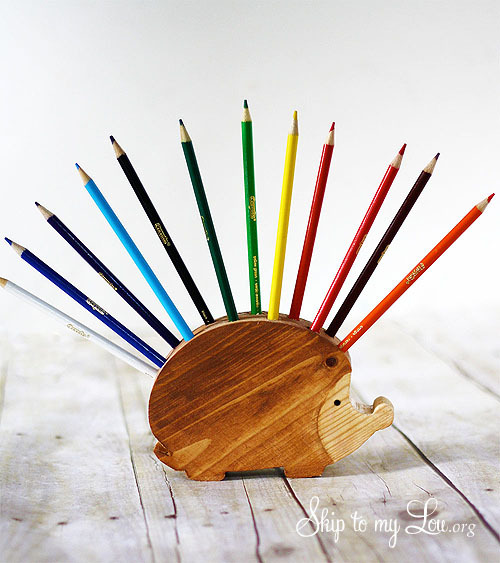 Download the template and cut the hedgehog out of a 2″ X 6″ board with a band saw. 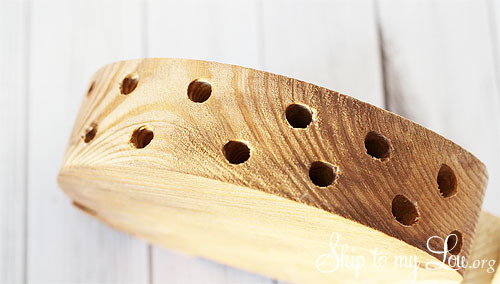 Drill 12 holes across the top. Make sure the size of drill bit fits the pencils or crayons. We practiced a few times on a piece of scrap wood. For our pencils we ended up using a 19/64 drill bit. Sand the entire hedgehog. Mask off body of hedgehog with painter’s tape and seal nose area with clear varnish. Allow to completely dry. Mask off nose area and lightly stain hedgehog, making sure to quickly wipe away excess. Wipe away from nose area to keep stain from running into nose area. Add a black dot for the eye. Put in a dozen colored pencils (or crayons) and you have a useful handmade gift! Lowe’s is the perfect place to find supplies so you can have a handmade holiday! For great ideas and loads of inspiration sign up for their FREE Creative Ideas Magazine. You can also follow Lowe’s on Facebook for more ideas. I really love it pencil holder, Superb idea Thanks for sharing !!! My two boys made these for their teachers for Christmas this year except we put yellow #2 pencils in them instead of the colored pencils. They turned out so cute!!!! Thanks for the idea and pattern! Such an adorable piece of work. You can actually make cute stuff like this and give them as gifts for the coming holiday season. It will be well received as it is made with effort. I love hedgehogs so this is adorable! It would make a great gift for a teacher! LOVE it!!!! That is SO, so cute!!! That is too stinkin' cute!!! Love it. Cindy you never cease to amaze me. I love this kids gift idea. So cute and useful!